Jack dreams of being on the school football team, but nasty Kev doesn't think he is good enough. With the trials fast approaching, Jack is running out of time to improve his football skills. Will he achieve his dream and make it onto the school team as striker? Perhaps with the help of a very special football card ... 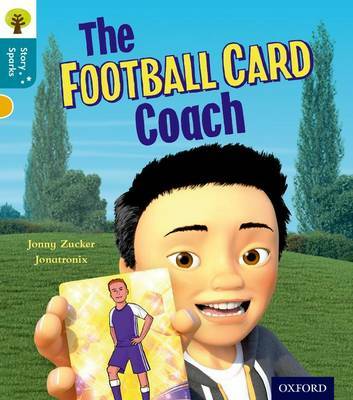 The Football Card Coach is an engaging 3D-illustrated tale about achieving your goals against the odds. Oxford Reading Tree Story Sparks is an emotionally-engaging fiction series that will fire children's imaginations. These 36 original stories will get children thinking, and develop and deepen their comprehension skills. The variety of authors and illustration styles broadens children's reading experience, with something to appeal to every child. All the books in the series are carefully levelled, so it's easy to match every child to the right book for them. They also contain inside cover notes, to enable parents and teachers to support children in their reading. Help with children's reading development is also available at www.oxfordowl.co.uk.